It is due to the immense Grace and Beneficence of Allah the Almighty that last week the Jalsa Salana UK [Annual Convention] of Ahmadiyya Community concluded safely. During all the three days of Jalsa Salana, we observed scenes of the Grace and blessings of Allah the Almighty nd every participant felt that the Help and blessings of Allah the Almighty were continually being sent down. Thus, no matter how much we give thanks to Allah the Almighty for this, it cannot be sufficient. True gratitude can only be offered, if we constantly endeavour to seek the pleasure of Allah the Almighty. The Holy Prophet(sa) said that one who is not grateful to people, is not grateful to Allah the Almighty either. Thus, due to this, all participants should be grateful to the workers who performed Jalsa duty. Likewise, the workers, should also be grateful to Allah the Almighty in every way, for Allah the Almighty enabled them to serve the guests of the Promised Messiah(as), guests, who had come for the sake of the faith and guests who had come to gain religious knowledge. Everyone from young children to the old served with exceptional sincerity. Likewise, the participants also took part in the Jalsa quietly, without spreading any restlessness or evil and benefitted from the programmes. Such a practical example presents a very awe-inspiring sight for a worldly person. The guests, who came from outside [the Community] have also been expressing their views. I will now present a few of their views, which they expressed after experiencing the atmosphere. They stated openly that if this is the teaching of Islam then this teaching ought to be spread in the world. The former foreign minister of Benin and advisor of the president, Maryam Boni Jialo Sahiba, who is currently the advisor and a senior minister writes: “through this Jalsa I was able to understand the Ahmadiyya Jama’at in greater depth. I am greatly impressed by the management of the Jalsa. Everyone sacrificed their own comfort and was ready to provide comfort and ease to others. I will never in my life be able to forget the smiling faces, which found happiness in serving other guests. She says that women have been given a great status and only through this can a healthy and peaceful society be established. Then, a member of the parliament of Guatemala, Iliena Calles expressed her feelings by saying that participating in the Jalsa was a very unique and astonishing experience. She says that the scene of volunteers serving thousands of guests was astonishing. She also mentioned the address to the ladies; the status of women and the mention of paradise lying under the feet of mothers and women. She further says that in comparison to the men’s marquee, I felt greater comfort, ease and freedom in the ladies’ marquee. Similarly, Sergio Moya, a professor of the National University of Costa Rica, attended the Jalsa. He states “I have witnessed a new picture of Islam through this Jalsa. I have seen a community of Muslims that is exemplary in mutual love and affection who present a practical depiction of their faith. An International Business Management student was also part of the delegation from Croatia. He says that he was very impressed with the love and dedication of the organization of the Jalsa. An elderly couple came from Croatia last year, who were Muslims also attended this year too and they said to me in our private meeting that “last year we attended as normal Muslims and this year we are attending as Ahmadi Muslims.” Hence, there is a great bounty of God Almighty in the Jalsa, as people take Bai’ats as well. Then a Member of Parliament of Sierra Leone, Mr Alie Kaloko states “Ahmadiyyat is the true representation of Islam. The efforts which the Ahmadi Muslims are making to spread peace are much appreciated. A guest from Turkmenistan, Mr Abdur Rasheed says “Since the day I arrived in London I have been surrounded by love and affection as if I am among my parents and relatives. After attending the Jalsa I came to the understanding that I have been in the search of God Almighty all my life but I have only found Him after coming here. An Egyptian, Dr Hany Rashwan Sahib, said that he arrived at the Jalsa Gah around the time of the international Bai’at. Upon witnessing the human chain, he was visibly moved and amazed. [The Jalsa] attracted a lot of attention from the press and media. Sonia Delesalle who is a journalist of a French paper, Libération, relates her impressions. She states: ‘When I first arrived here I was quite concerned because the men and women had been segregated. However, when I visited the Jalsa arena, I noticed that instead of women the men were preparing food. I then spent some time in the ladies section [of the Jalsa] and I realised that due to their separate arrangements they had more freedom and above all they were completely independent and did everything as they wished.’ Thus, some of the young girls living here who in the name of education or freedom claim that they are being treated unjustly need to ponder over this that even those outside of the community appreciate our atmosphere. Another journalist working for a national news channel in Bolivia expressed his impressions: ‘According to the West, Islam holds women back and they are considered to be given no importance. However, I saw that the Head of the Ahmadiyya Community was giving awards to women who had achieved notable success and each person was individually being called up by their names. Another journalist began to repeat the words that were being recited during the International Bai’at. Upon being asked she said: ‘I don’t know what happened to me at the time and never in my life have I ever experienced such feelings and emotions and instinctively I began to repeat the words. Thus, the atmosphere of the Jalsa and the atmosphere created by those giving duty impresses every fair-minded person. May Allah the Almighty reward all those who offered duties and also the attendees who were part of the silent preaching of the Islamic values. We must remember the thousands of male and female volunteers including boys, girls, men and women in our prayers.. I would also like to say to the administration that all of the complaints or matters that require attention which I am sending to them should be noted in their Red Books and they should seek to make further improvements for the future. Similarly, the press has given very good coverage. Through the media outlets, 358 news reports have been published about the Jalsa Salana and this is still increasing. 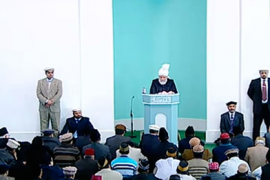 The message [of Islam] was conveyed to 36 million through online media.. My concluding address was aired on MTA Live stream and around 250,000 people watched this address via live streaming. Thus, according to a very conservative estimate, the message was conveyed to over 128 million people. Some of the more prominent media outlets which gave coverage on the Jalsa include: BBC TV, BBC Radio, ITV, The Independent, The Times, Sunday Express, London Evening Standard, New York Times, Facebook Live, Associated Press, Press Association, Special News Agency EFE, an Indian news agency called PTI and French news agencies included Libération and UNILET. Thus, we should express our gratitude to Allah the Almighty for this extensive coverage of the message of the Ahmadiyya Community and the true message of Islam through the media outlets. The Jalsa Salana was also given coverage in Africa. Apart from MTA Africa, ten other channels showed the proceedings of the Jalsa Salana and in total the coverage from across different countries was over 150 hours. Aside from the live broadcast of the Jalsa Salana, BBC Uganda covered the Jalsa Salana in Swahili language, which is viewed by a large audience. For our part in this I am very grateful to our Press & Media section, as well as the Press & Media section of other countries who also made an effort. May God Almighty reward them. Just like last year, this year again, Khuddam from Canada came and took part in the work and clear up [of the Jalsa site]. May Allah the Almighty reward all of them. The Khuddam of Canada who arrived before Jalsa, I hope they listened to all of the Jalsa proceedings. If they have not then this is absolutely wrong. Therefore, if they wish to come in future, then they should listen to the Jalsa proceedings throughout the three days, and then they should partake in the clear up program. May He grant us the opportunity to adopt all the teachings that we learnt during the Jalsa Salana and include them in our lives. After the prayers I will lead some funeral prayers in absentia. The first one is of Mrs Sahibzadi Zakia Begum Sahiba, who was the wife of Col Mirza Daud Ahmad Sahib. She was the daughter of Nawab Amatul Hafeez Begum Sahiba and Nawab Abdullah Khan Sahib. She passed away in Tahir Heart Institute on the evening of 23rd July 2017, at the age of 94. To Allah we belong and to Him shall we return. By the Grace of Allah she was a Moosia [part of the institution of Al-Wasiyyat] and has been a Moosia for a long time. Dr Noori Sahib writes: “Hospitality was one of her great attributes.” Dr Noori Sahib further states: “When I devoted my life for the services of the Jamaat after my retirement she said that: ‘it was a great desire of mine that should I be bestowed a son I would devote him. Now that you have dedicated your life, you have fulfilled this wish of mine.” May Allah the Almighty elevate her status and shower His Mercy and forgiveness on her. The second funeral is of Mr Tariq Masood Sahib, who was a missionary serving in the Nazarat Islah-o-Irshad Marakazia, and the son of Mr Masood Ahmad Tahir Sahib. He passed away in Rabwah on 24th July at the age of 27, after being electrocuted by a high voltage wire. To Allah we belong and to Him shall we return. He had a deep love for Khilafat and a very pious individual. He was regular in offering his prayers in congregation. Even before he became a missionary he would urge the family to be punctual in offering prayers. After the Fajr prayers he would regularly recite the Holy Quran. The third funeral is of Respected Shakil Ahmad Munir Sahib who was the former missionary in-charge of Australia and was currently residing in Karachi. He passed away on the 31st of July at the age of 85. To Allah we belong and to Him shall we return. He had the opportunity of translating the Quran in Maori language. He was a very humble and selfless person. There was no hint of arrogance due to his intellectual abilities nor the fact that he had translated the Holy Quran, therefore he should be given some precedence. He was very affluent in worldly respects and even served as a missionary without an allowance. May Allah the Almighty shower him with Mercy and elevate his status. May He grant his wife patience and steadfastness. May Allah the Almighty continue to grant us missionaries in the future who are completely selfless and humble in every respect.